Glad to see you've turned to blogging! Can't wait to read your posts! Yay another convert. Welcome to the dark side. Just kidding! You are going to have the best time. 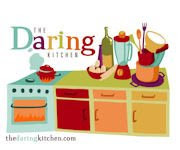 And Daring Bakers also, fun & fattening, that is a hard combo to beat. I will be looking for your posts and your results on the August challenge. Yes, we are anxiously awaiting your first post! I'm hoping it's going to be the August Daring Baker's challenge! Very pretty with that wonderful filling! Great job! Your eclairs are "Pretty in Pink." Very nice! Mmmm...tart cherries. I love the color they imparted. Beautiful! Wow! Congratulations, your éclairs are just... have no words, charming, elegants, yummy, cute... English is not my language but I love your pink éclairs.